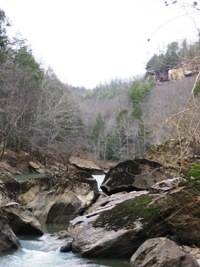 On a mid-February backpacking trip along the Sheltowee Trace, my girlfriend and I were intrigued by the numerous waterfalls that were either visible or audible from the section of trail between Cane Creek and the parking area at KY-192. The most numerous of these waterfalls occurred between the confluence of Pounder Branch and a small tributary, located approximately a mile and a half down the trail from the parking area, and the bridge that crosses Pounder Branch. Our schedule on that trip kept us from properly exploring the Pounder Branch gorge, and we decided to return later in the year to dedicate as much time as possible to exploring the area. The sandstone cliffs, springs and rocky streams of the Hemlock Cliffs area of the Hoosier National Forest in south central Indiana form a landscape reminiscent of the backcountry at Mammoth Cave National Park or certain sections of the Red River Gorge. The relatively short Hemlock Cliffs Trail, approximately a mile in length, features two seasonal waterfalls as its main attractions. During a mid-March trip to the area, these waterfalls were flowing and clear waist-deep pools were present in the trail-side creeks. However, the mission of the four-night backpacking trip my girlfriend and I embarked on over our spring break was to explore as much of the area off the beaten path as possible. A U.S.G.S. topographical map of the area aided us greatly in deciding where to focus our hiking and in making sure we stayed on Forest Service property. After spending Valentine's Day weekend in the Daniel Boone National Forest backpacking the loop formed by the Sheltowee Trace and the Rockcastle Narrows East trail, I can say for certain that I have fallen head-over-heels in love with this area. My girlfriend, who had never been backpacking prior to this trip, was thrilled with the experience and said she couldn't imagine a better introduction to backpacking. The trail was easy to hike on and surrounded by beautiful scenery. I can't remember encountering one dull stretch of trail during the 11 miles we covered. My mission: Take 10 hikers and myself to Red Byrd Arch, in the Clifty Wilderness, via ridge top and bring them home alive. The players: An assorted cast from Kywilderness.com, Redriversaga.com, 2 new guys from Louisville and Joseph my 10 year old son. The result: Most of them came back alive. 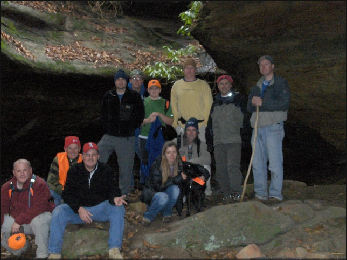 On Friday, December 17 I headed to the Clifty Wilderness in search of Timmon's Arch. Armed with excellent directions from Timbros, a topo and a compass, I was confident of success. This was an open call for all who visited the message board to join in. Sadly, as with most of my adventures, it ended up being a solo journey. I'm sure that going on a weekday has a lot to do with that. Well, that or I'm going to have to switch deodorants.